Vincent turned into the hall before their chamber, half-striding, half-rushing back to Catherine. He found her there, agitated to the point of distraught, rummaging through every paper, every book within her reach, which, he had to grant, was far too many. What had been an orderly, single man’s room not long ago had become a cramped family’s chamber where entropy had taken full hold. With the baby, so new and needy, things had simply gotten out of hand. She didn’t answer, nor did she stop choosing books from the piles that littered their table to fan open. She was clearly looking for some sort of paper and close to frantic; she seemed to be picking books at random. He was almost certain she had never glanced at his Karst Hydrogeology and Geomorphology in the entire time he had known her. Vincent navigated the chamber’s obstacles - the furniture, new and old not happily mixed, random clothing and blankets, and the books and papers that had been displaced by Jacob’s things -to get to her. Before Catherine could pick through another piece of paper, he took her hands into his own, firmly but gently, stilling them. She finally looked from her task. He held her gaze for a moment and then, speaking only with his eyes, looked to their son now stirring in his cradle. She dropped her hands from his, walked over to what had been his lonely bed for most of his life, now unmade, unkempt, but, miraculously, theirs. She slumped onto the mattress, defeated. “But I wanted to give you something,” she went on, disregarding his last thought, “so I wrote you … a letter.” She picked up another book and leafed through it, but none of the pages fell open to her paper. “I was looking through some books and …” She sighed again. “It was the only thing I could think to give you, and now I can’t even find it.” Exasperation colored her wavering voice. She seemed on the verge of tears for a moment at her loss of memory, her loss of control, but then her anger flared again instead. “What can I give you now, Vincent, a hearty handshake?” She nearly slammed the book down, but caught herself before she woke the child. Instead, she pushed the traitor tome across the table away from her. “Catherine.” He dropped his shaking head with disbelief. How can a woman who is so intelligent be so blind to her own virtues, her own gifts? Vincent approached the bed and lifted Catherine into an open embrace. His fur-covered finger raised her downturned face. She had to understand. “Catherine, what you have given me …” He stopped and breathed out, because any words he would offer would represent the barest surface of what he felt, the slightest crust of ice upon the deepest fathoms, but for her he would try to explain. “Catherine.” He shook his head at her almost willful blindness. “I think you are forgetting the early anniversary gift you gave me.” He tuned her towards the baby, who was once again sleeping soundly. A very typical child, but to his parents, he was the fulfillment of a dream too tenuous and fragile to have even been spoken of prior to the flutter of movements inside her, before the whisper of his feelings within their hearts. “Good, because I can give you little else this year,” he chuckled. He had been as overwhelmed with their son and all the changes the tiny boy had brought as she. “That was very quick,” he teased her back, “considering we were only married a week ago.” He was happy to allay any of her worries if he could, and an idea was forming that might help her even more. “But I think,” he slowly began, while still thinking how his new plan could be accomplished, “I have something I can give you, Catherine.” He let her go and walked over to the cradle. “You just fed him, correct?” But he really didn’t have to ask. When he had been away, discussing chamber expansion with Kanin and Mouse, he had experienced Catherine’s concern for Jacob’s distress, his anticipation, and then the shared calm that Vincent equated with nursings. He lifted the entire cradle easily and started taking the sleeping child out of the chamber. “Where are you taking him?” He could hear the amusement in her voice, the trust, but also the tiniest bit of worry, a mother’s worry. By the time he returned, Vincent could see she had gone through a few more books and had found her note. It was folded, held tight within her hand. She was not ready to show him yet. He brought her a fisherman’s long cardigan back from Father’s room to wear over her blouse. She put down the paper on the only unused and uncluttered area of the table and slipped into the sweater he held open for her. “Where are we going?” Catherine asked, although Vincent was fairly certain anywhere out of their chamber would have been acceptable. She looked joyful, but underneath he could still discern her lingering doubts, her disappointment with herself for what she could not give him. “You will have to see,” he said, searching for and finally finding his cloak under a pile of her clothes. After draping it around himself, he took the hand that he had been gifted with and drew her out of the chamber. When they reached the stairs to go Above, she gazed back at him with slight trepidation, as if they were breaking the rules. “I can carry you if you like,” he told her close to her ear like a secret between them. He followed her up the winding stair and then led her, her hand in his, towards the entrance to the Park. Jon was standing sentry. His usual dour expression seemed to be banished for them. “Thank you, Jon,” Catherine replied, thanking him most for his open good wishes. Vincent managed the switches at the door, and they were soon walking the Park’s paths on a balmy spring night in New York; the fragrances of the blossoming trees and flowers were mixed with the smell of car fumes and rain on pavement, all combined to form the essence of the city. To Catherine, there seemed nothing more glorious. “Thank you,” she breathed, her arm curled into his as they meandered down one of their familiar paths. “I could not give you your balcony,” he said, his voice full of regrets. “It’s perfect,” she assured him, thanking him again within the words. Too close, too often – the possibilities took her words. She could not even speak of it. “Come. There’s a place I want to show you. It’s just over here.” He led her to a brick path, one they had rarely used, since it was usually spattered with people even at a late hour, but this night, wondrously, deserted for them. Magnolia trees in full flower faced one another, framing a path that led to a less-cultivated area beyond. They could smell the pines further down the trail, but over them the magnolia blossoms scent dominated, cherry tree-like, but with lemon and vanilla mixed in, and just the slightest bitterness beneath. Under their booted feet a layer of the magnolia’s suede-like petals littered the ground. They would soon decay, becoming a white- and rust-colored carpet that would be swept away by a park worker or the wind. 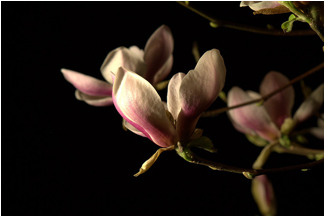 Catherine ran her hand over a bloom that seemed to glow even in the dim light of the lamps and the moon. A piece fell into her palm, and she stroked its soft but catching surface, as downy as their son’s cheek. “The trees, the night, it’s all so beautiful,” Catherine proclaimed, admiring the view he had given her. She was here, in the Park with him, but part of her mind was far beneath them, wondering, slightly worrying. Vincent understood. His thoughts seemed always drawn to the tiny being too. She pulled back to gaze within the cloak’s hood that hid him from all the world, save her. “Until you, there was little else to occupy my time but the cultivation of my mind,” he answered with dry humor and affection. She couldn’t argue with his logic. Their time together was limited once again, but for a more beloved reason than even the rising of the sun. They headed back, but she soon visibly withered, her stamina still greatly reduced from Jacob’s birth and tending. They cleared the low ceiling of the culvert and he lifted her easily into his arms, blessing the strength that allowed him to carry her back. He could carry them for a while. As he finally returned them to their chamber, he heard the others leaving, far down the hallway by the time he rounded the nearest turn - Kanin’s slightly shuffling steps, Jamie’s sure footing, Sarah’s light feet, Cullen’s slide, and Zach’s run - all of them sneaking away without thanks for the good deed they had offered to secretly render. They needn’t have bothered; Catherine was almost asleep on his shoulder, oblivious. She only stirred for Jacob, returned to his place next to their bed. He was now beginning to work himself into a hungry wail, and for a moment her focus was only for him, but then she saw the room. Vincent set her down, her shock magically quieting the baby’s protests. The chamber had been completely transformed. The piles of books were gone. They had been moved to a new book shelf that Kanin and the others had placed where his now-absent bronze statue had stood. The clothes were gone too, put away or taken away, and a changing area had been set up on Vincent’s dresser. There were two chairs at the cleared table, the second one sturdy, but not as heavy as Vincent’s. On the wooden table top a vase filled with lilacs and peonies stood above two plates of what looked to be chicken salad, and a basket of warm rolls, and tea. The bed was blessedly made with one of Sarah’s quilts. How could a bed exude such a sense of comfort and warmth by simply being made? On the pillow lay a single rose for Catherine, and next to it her note. Catherine smiled; the slight embarrassment she may have felt at someone reading her note or helping with their mess was completely overshadowed by her pleasure and gratitude for the clean and inviting chamber that greeted them. Her amazement could only keep the baby from his singular need so long, and he began to fuss again. Catherine left Vincent with a stroke of her hand down his arm and went to the cradle. She lifted the newborn to the bed, one hand supporting his head, the other under his wrapped body, so light and so substantial at the same time. She unfolded his swaddle and his arms and legs instantly began their active dancing, while he started his “na” cry for her. Gently shushing him, she took off the heavy sweater, placing it on the end of the bed. Picking up the blanket and baby both and putting him in the crook of her arm, she crawled up onto the quilts and settled herself crossway with her back to the wall. She took the rose from the pillow, ran the soft petals on her cheek, and placed it next to her. She set the note there too, and only then was Vincent awakened from watching her with their son. “May I have that now?” he asked Catherine as she placed the pillow on her lap. She thought about it a moment as she undid her blouse and latched the hungry baby to her breast. Vincent easily crossed the organized chamber to his now contented son and astonishing wife. There was nothing he would not do for her, and nothing he wouldn’t do for their son. How can so much be encompassed in just two people? He gently ran his hand down his child’s back and kissed his wife’s head. Carefully, so not to disturb them, he sat next to her on the bed and opened the cream paper. Three years ago you chose compassion over safety and brought me here to heal. Your one deed opened a world to me and me to the world. We have begun to build a life together now, but the stone it is based upon was your one act of faith, your belief that saving me would not doom you to a life of imprisonment, and, without even realizing, you gave me freedom. I know that you have worried that our choices would limit me, but instead our dream, especially in this last year, has granted me freedom. You have given me freedom to care for you in your illness, freedom to give you all that I am, and give birth to our precious child surrounded by people who love us, freedom to declare my love for you and forge a life together, freedom to be myself. You saved me countless times, and in so many ways freedom is what you have given to me. It is you who has given me everything, everything I didn't know I could have, everything I didn't know I could want. Now I cannot imagine a life without you, or our son. "How far that little candle throws his beams! So shines a good deed in a cruel world." I am sorry I cannot think of anything else to offer you this year but this letter, and the certainty that I love you with all that I am and all that I have, and will do so forever and always. P.S. Yes, I know I changed the Shakespeare, but “naughty” has such a “naughty” ring to it. Sue me. I’ll win. Vincent laughed loudly in a way she had hardly been blessed to hear, and she knew he had gotten to the end. When he looked up to Catherine’s happy yet slightly embarrassed grin, he couldn’t help but pull her over and kiss her head again. She laughed too as the baby got bumped off by her husband’s affection, and looked up at his parents with a decidedly bewildered expression on his tiny face. She settled him in again and placed her head on Vincent’s shoulder. Love, family, laughter, joy, freedom - what other gifts could they ask for?